FILE - Pope Francis speaks during his weekly general audience in St. Peter square at the Vatican, Nov. 22, 2017. Pope Francis says countries have a responsibility to fight anti-Semitism and the "virus of indifference" threatening to erase the memory of the Holocaust. Francis' comments to an international conference Monday comes as the largely Roman Catholic Poland considers legislation that would outlaw blaming Poles for the crimes of the Holocaust. The proposed legislation has sparked an outcry in Israel. Francis didn't mention the dispute but he spoke of his 2016 visit to the Auschwitz-Birkenau death camp in German-occupied Poland, saying he remembered "the roar of the deafening silence" that left room for only tears, prayer and requests for forgiveness. 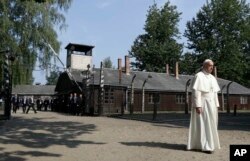 FILE - Pope Francis walks through the gate of the former Nazi German death camp of Auschwitz in Oswiecim, Poland, Friday, July 29, 2016. He called for Christians and Jews to build a "common memory" of the Holocaust, saying "it is our responsibility to hand it on in a dignified way to young generations."